This paper looks at the influence globalization exerts on wage negotiation processes and outcomes. Specifically, it establishes whether, compared to their purely domestically oriented counterparts, exporters share a higher fraction of the rents they generate with their employees. 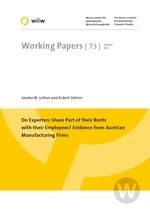 The analysis uses a panel of Austrian manufacturing firms between 2002 and 2006 and demonstrates that, in general, Austrian exporters do not share a higher part of their rents with their employees. Moreover, the analysis also takes into account that exporters are a very heterogeneous group, broadly differing in terms of the degree to which they trade internationally or to which they earn rents from their export activities. Against that backdrop, it determines whether rent-sharing systematically differs by the degree of internationalization of exporters. The results emphasize that particularly the most export-oriented firms are able to cut down on rent-sharing which corroborates the idea that exporters can credibly and effectively exploit their threat-points of either outsourcing or offshoring part of their production which induces employees to concede to more moderate wage changes so as to avert the potential loss of employment.